Just imagine you’ve spent a heavenly Hawaii day surfing, sightseeing, and sunbathing. Now what? Find a beach where you can watch a spectacular sunset, of course! 1. North Shore: Spanning more than seven miles, the North Shore’s beaches host some of the world’s premiere surfing competitions. But, Sunset Beach, from the Banzai Pipeline area to Sunset Point, is, of course, among the most popular places to bring a camera during dusky hours. If you catch the sunset on a weekday outside of visitor season, you may even find you can enjoy your sunset with just a few scattered shutterbugs on the beach. But, even if you’re in the company of a crowd, this sunset is still a spectacular sight. There's no better way to wrap up a day of watching big wave surfers on Oahu's North Shore than by catching a perfect sunset. 2. Waikiki: There’s a reason tens of thousands of visitors make Waikiki their Hawaii destination every year? 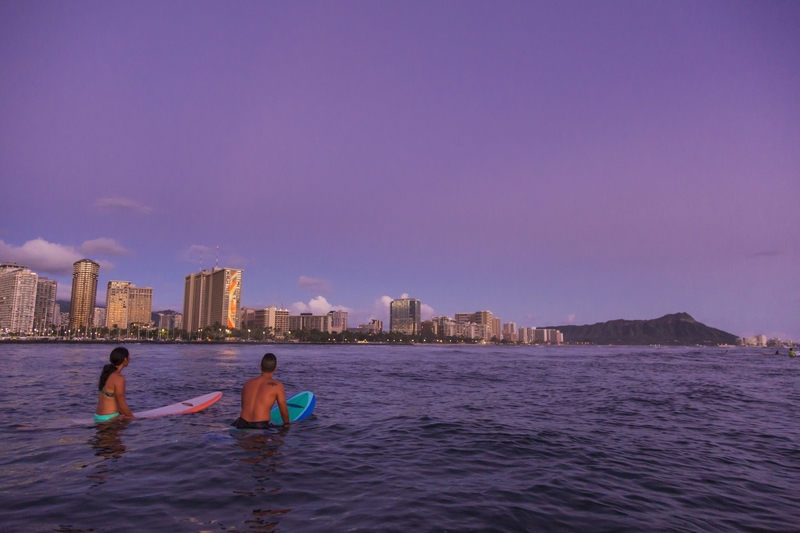 With its amazing Diamond Head views, white sandy beaches, and manageable shore breaks, the area is truly one-of-a-kind. To catch the best Waikiki sunsets, try your luck standing on the sand edging the pink Royal Hawaiian Hotel. 3. Ko Olina: Ko Olina is one of Oahu’s up-and-coming resort areas, but it’s already made its name as one of the best places to watch the sunset on Oahu. The gentle lagoons that front some of the island’s most posh hotels make the perfect place to relax on a beach chair and absorb the beautiful sight. You can even take a sunset cruise or literally sail into the sunset! 4. Ala Moana Beach Park: After a day of shopping at Ala Moana Center, why not pack-up and head to Ala Moana Beach Park, which is a short walk away? There, you can lay on the beach and watch one of the most amazing sunsets in Hawaii. If you go on a Friday night, you can stay for a bit after the sun dips below the horizon for a family-friendly fireworks show. Whether viewing by land or sea, Hawaii sunsets have a way of transforming everything around you. 5. Kakaako Waterfront: The Kakaako Waterfront leads the list of the most unlikely places to find a beautiful sunset on Oahu. This functional waterfront is in one of Oahu’s most gritty industrial districts (which is now becoming a high-rent district). But, that makes it all the more fun to watch a sunset here. Enjoy the peaceful sunset at one of the most urban places on the island. Watching the extraordinary sunset on Oahu should be one of the first things on your Oahu to-do list! After an Oahu Circle Island Tour, Hawaii Five-0 Tour, or Aloha Plate Tour, there’s not better way to finish-off your day. 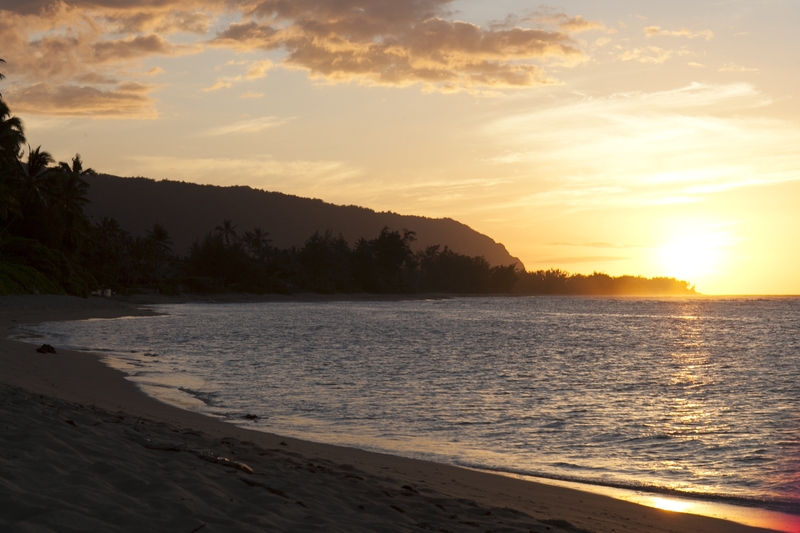 So, grab your picnic basket, relax, and enjoy a breathtaking sunset on Oahu!